‘Chardonnay’ takes its name from the village of Chardonnay in the Burgundy region of France. It was brought in to the United States in the early 18th century by a California- based grower. Because of its versatile nature, Chardonnay is grown in almost every region of the world, no wonder it is also the number one white wine variety in terms of acreage and preference (Figure 1). Recent studies has have shown that Chardonnay is a cross between Pinot Noir and Gouais blanc. Depending on the soil type, climate and root stock, its growth is weak to moderately vigorous. 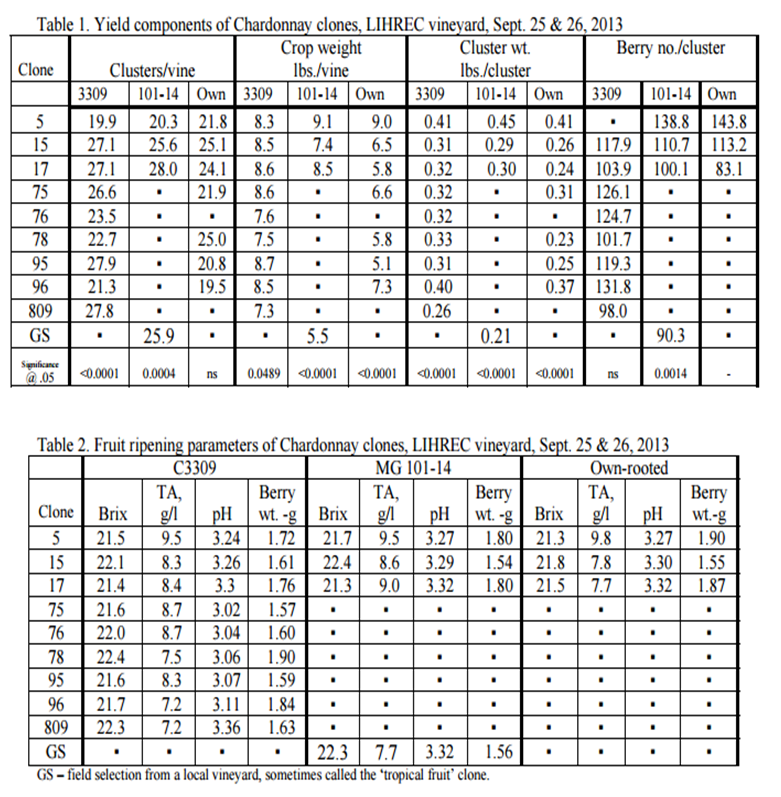 Chardonnay has performed successfully on a wide variety of root stocks, however the type of root stock should be selected after considering the expected vigor from particular site. Chardonnay has numerous clones which are somewhat different from each other, however that difference may be important to your site. Below are some of the well-known clones for cool climates (also see, Table 1). Clones are the result of years of selection for desired trait and are propagated vegetative, often by cuttings from original mother vine. That trait could be fruit compactness, cluster size, vigor, winter hardiness, fruit composition or timing of the ripening. Dijon clones: Also known as French clones, they come from a district in Burgundy, south of Dijon. These clones are bred for their adaptiveness to terroir, naturally lower yield and smaller fruits which helps in (1) canopy management and (2) concentrating the flavors and (3) early ripening. Clone-95, 96 are known for uniform fruit set under cooler bloom conditions, higher number of moderate to large berries however with more flavor-concentrated clusters. Rich, fine and well balanced wine. Clone – 809, 77 have highly aromatic fruit flavor; clone – 809 has orange blossom aroma with musque undertone and does well with cold tank fermentation. Clone – 75, 78, 121, 124, 125 and 277 are more vigorous but high yielding clones with very good quality wines. California Clones: Also known as Wente Clones, most of them have origins (cuttings) from Wente Vineyards, Livermore, CA. The planting material was further selected and cleaned (of pathogens and viruses) by University of California’s Foundation Plant Services, (FPS). Clone – 17 produces consistently high quality wines with an excellent green apple flavor, and full bodied, roundish and fleshy characters. Good with Malolactic fermentation, shows off new wood characters. FSP 15 also known as ‘Prosser clone’ came after many years of variety trial in Prosser, WA. Known to be sour-rot and rot resistant, projected to be ideal for cool climates. Remember that there is no such thing as the perfect clone, as the same clone responds differently based on a site’s environments which includes soil, local climate, and cultural practices. For example, two blocks of grapes from same clone and same site, however picked 2-3 weeks apart could have very different sugar levels and resulting wine flavors. Figure 1. 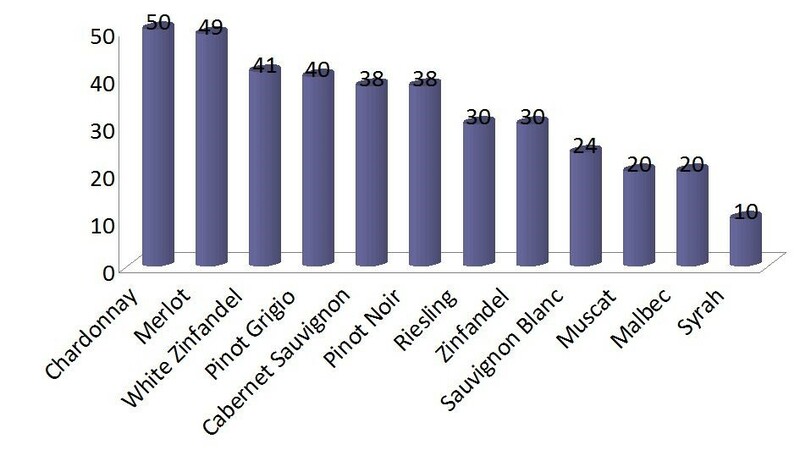 Favorite Varietals by percentage of Respondents. Responses to the question: “What are some of your favorite wine varietals? Check all that apply.” 2015 Survey of American Wine Consumer Preferences by Liz Thach, MW and K. Chang, Sonoma State Uni. Sources: Keller M. (2015), Wise A. (2013), Chardonnay Grape Encyclopedia, FPS Grape Program Newsletter, ‘Wine Grapes’ by Jancis Robinson and UC ANR publication 3419.